A good deal of sunshine. High 91F. Winds NW at 10 to 15 mph..
Javier Casarez, the gunman who shot and killed five people before turning the gun on himself Wednesday evening. Remnants of Sheriff's barrier tape are visible Thursday morning on a closed gate at T&T Trucking at 660 Manwell Blvd., where two people, a man and a woman, were she by another man Wednesday. Deputies close off the area in the parking lot of A-1 Battery and Bear Mountain Sports at Weedpatch Highway and Di Miller Drive just south of Highway 58 where one of five victims were shot and killed. Six total died, including the shooter, who killed himself. One of five Bakersfield shooting victims lies behind barrier tape between Bear Mountain Sports and A-1 Battery at Weedpatch Highway and Di Miller Drive just south of Highway 58. Three were shot at this location, two more on Breckenridge Road and the shooter killed himself on Edison Highway after being confronted by a deputy. In all, four men and two women were killed. One of five Bakersfield shooting victims lies behind barrier tape between Bear Mountain Sports and A-1 Battery at Weedpatch Highway and Di Miller Drive just south of Highway 58 on Wednesday night. A crowd stands at the corner of Weedpatch Highway and Di Miller Drive just south of Highway 58 in Bakersfield, where earlier three people were shot and killed. Two more were killed later on Breckenridge Road and the shooter killed himself on Edison Higheay after being stopped by deputies. Deputies close off the area in the parking lot of A-1 Battery and Bear Mountain Sports at Weedpatch Highway and Di Miller Drive just south of Highway 58 where one of five victims were shot and killed Wednesday. Six total died, including the shooter, who killed himself. The man who fatally shot five people then turned the gun on himself Sept. 12 had been divorced four months and was going through court proceedings stemming from the dissolution of his marriage, Kern County Sheriff Donny Youngblood said. "Obviously this has indications of a domestic violence case," he said during a press conference Sept. 13 morning in which he played body camera footage that captured the shooter's final moments. 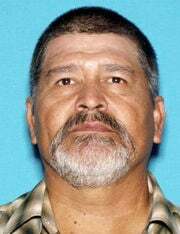 The shooter, identified as Javier Casarez, 54, brought his estranged wife, Petra Maribel Bolanos De Casarez, 45, to a trucking company in southeast Bakersfield at 5:18 p.m. The shootings may involve more factors than domestic violence, the sheriff said. Investigators are looking into rumors they’ve heard regarding Casarez but nothing has been substantiated yet. "We are getting divorced because my wife cheated on me. I would like for the judge to grant me a subpoena for me to see the text messages to whom my wife texted to." He then listed three phone numbers. The couple had been married 28 years and lived the past four years at a residence on Kam Avenue, south of East Panama Lane and east of Weedpatch Highway, the divorce petition show. They leave behind three children ages 18, 17 and 10. They shared joint custody. When he arrived at T&T Trucking with his wife, Casarez confronted and gunned down employee Manuel Contreras, 50, then turned the gun on his wife. Casarez chased another person at the business, Antonio Valadez, 50, to the front of Bear Mountain Sports and shot him too, the sheriff said. Shortly afterward, Casarez went to a house on Breckenridge road and shot dead Laura Garcia, 31, and her father, Eliseo Cazares, 57. 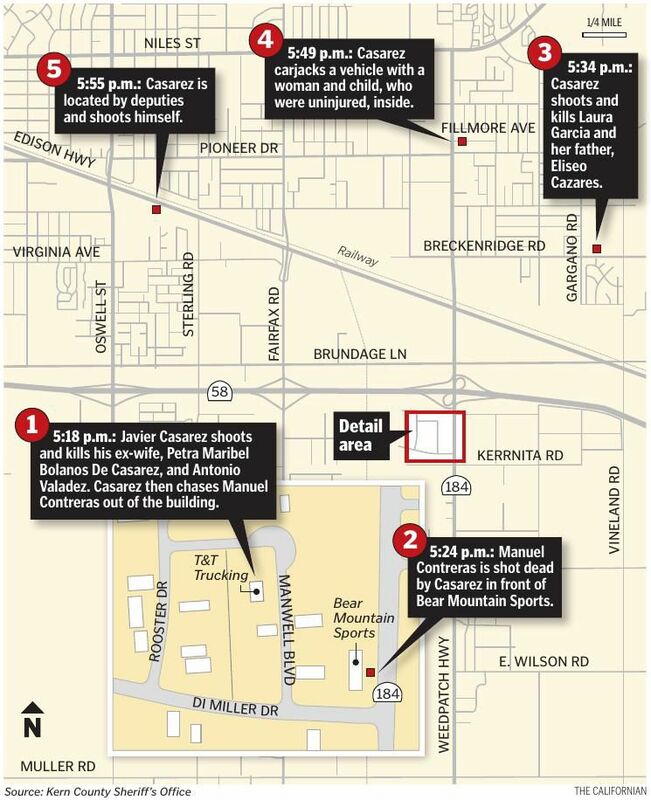 The relationship between the shooter and Garcia and Cazares is not yet known, sheriff's officials say. Garcia may have tried to intervene when she was shot, Youngblood said. Her four children were in the home at the time. Casarez then carjacked a vehicle with a woman and child inside. He told them something similar to, “I’m not a bad guy,” then let them go and drove off in the vehicle. A deputy followed Casarez and confronted him when he pulled into a business on Edison Highway. Youngblood said a friend of Casarez worked at the business. The deputy ordered Casarez to drop his weapon and Casarez said he didn’t want to live. He then shot himself in the stomach, according to Youngblood. Casarez used a Smith & Wesson Model 500 handgun in the shootings. It's a .50-caliber gun and is one of the largest caliber handguns on the market, the sheriff said. Smith & Wesson's website describes the weapon as the "most powerful production revolver in the world." The entire series of events took place within the span of about 30 minutes. Youngblood said Casarez’s handgun only held five shots so “he obviously had to reload." He said it appeared Casarez targeted each of his victims and didn't choose them at random. The sheriff noted Casarez left the woman and child leave the carjacked vehicle unharmed. It was unknown whether Casarez had a criminal record. The investigation is still in its beginning stages, Youngblood said, and that hasn't been determined. No charges against a person by the shooter's name and age are on the Kern County Superior Court website. Youngblood said the last incident he could recall with this many victims occurred in 2003 when Vincent Brothers shot and stabbed to death his mother-in-law, estranged wife and their three small children. "This is a devastating event to our community," he said. The Edison Elementary School District, which has two schools near where the shooting took place, said it is providing grieving centers in light of the shooting. Superintendent Erica Andrews said one center will be located at the Orangewood Elementary School library and the other at the Edison Middle School multipurpose room. The centers will be open to any students, faculty and staff as well as any parents who need support. "When tragedy strikes so close to home, it is normal to feel anxious," she said. "We should expect, try to understand, and accept a variety of emotions and behaviors. The most important thing we should do is be supportive and encourage discussion — both at school and at home — about this incident and the feelings it gives rise to." Andrews said the district has a comprehensive safe schools plan in place and that the safety of the students is a top priority. The district did not confirm whether victim Laura Garcia’s four children attend either of the schools. Anyone who had contact with Casarez on Sept. 12, or anyone with further information as to what may have led to the shootings, is asked to call the Sheriff's Office at 861-3110. Californian staffers Jason Kotowski, Sam Morgen, Joseph Luiz, Steven Mayer, Robert Price and Stacey Shepard contributed to this report.